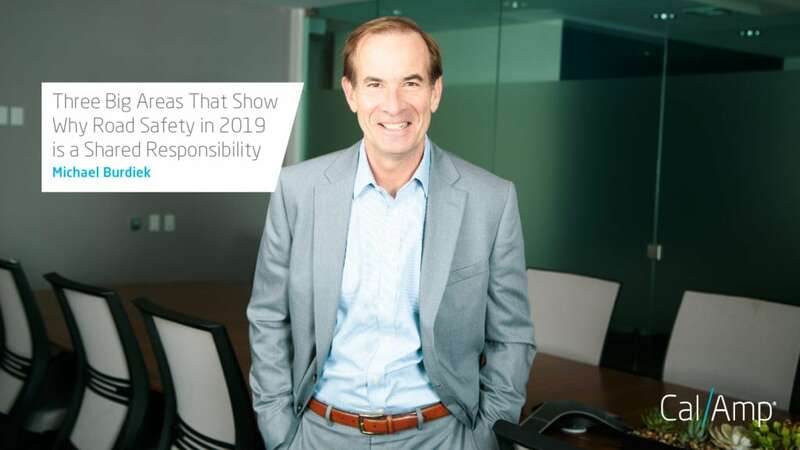 Recently, I had the honor of joining the governing board of Together for Safer Roads (TSR), a coalition of companies across various industries collaborating to improve road safety. As a company, CalAmp has been a TSR member since 2017. I think both my personal and the organizational commitment come from the same place: an appreciation of how crucial the “together” part is in the road safety equation. TSR is founded on the principle that road safety is a shared responsibility, and the only way to significantly reduce the toll — 1.3 million deaths and 50 million injuries annually — from traffic collisions is through a tremendous effort of cross-industry collaboration. Nowhere is this principle better reflected than in TSR’s diverse membership roster, including AIG, ABinBev, AT&T, CalAmp, Ericcson, Lyft, Pepsico, Republic Services, UPS, Walmart and many others. For me, the wisdom of looking at road safety as a shared responsibility is that you begin to see opportunities for shared solutions — collaborative remedies to both longstanding and emerging road safety challenges. Crash Response — Simply put, crash response is getting better and better, and we’ll continue to see improvements thanks to increasingly sophisticated and interoperable platforms where various first responders and emergency personnel can get instant, granular detail on the location, nature and severity of a crash — even road conditions and other potential factors. Diverse data and nuanced insights save lives. Telematics is the connective tissue that links all this information and makes it available to responders before they even arrive on scene, and all of it more timely and accurate than what could ever be conveyed on a 911 call. Autonomous Vehicles — An autonomous car is an object lesson of what’s known as a system of systems — where a major new innovation can arise from the accumulation of the many smart systems (in this case braking, acceleration, steering, perception, motion planning, etc.) that went into it. Not surprisingly, such a complex technology ecosystem is supported by a vast chain of diverse digital and traditional manufacturing suppliers. This complexity is part of why analysts are slowing their expectations for autonomous drive; and it’s why progress relies on standardization and cross-industry collaboration. Vehicle Cybersecurity — The same complex technology systems that enable connected cars and autonomous vehicles also represent broad attack surfaces for cyber threats. A modern vehicle can have millions of electronic control units, and a single cybersecurity vulnerability can affect more than a million cars at a time. Not surprisingly, any effective cyber protection requires collaboration across the supply chain — so that no link in that chain becomes the weak one that allows a threat actor to gain entry. CalAmp’s contribution to TSR is centered on how telematics can support these and other TSR focus areas in road, vehicle and driver safety. But, there’s a larger “how” that infuses everything we do. Ultimately, we summarize all our work as leveraging connectivity, real-time analytics, and data in motion to create what we call The New How for the connected economy. Against this backdrop, CalAmp’s outsized focus, teamwork and safety is entirely intentional. That’s because, for us, the biggest “How” of all — is How to save lives.